We all know it’s what’s on the inside that really counts. But boy, what’s on the outside sure can titillate, thrill and work us into a frenzy, too. Oh, come on. You know I’m right. What attracted me in the first place to this recipe from Flo Braker’s “Baking for All Occasions” (Chronicle Books) was what was inside. After the rectangular galette emerges from the oven with its filling of sliced apples, walnuts, sugar, cinnamon and allspice, it cools just until you won’t burn your fingertips. Then, you carefully slip tiny pieces of sweet, deep, rose-colored quince paste between the apple slices. The quince paste, which you can pick up in the cheese section of any well-stocked grocery store, not only adds color, but a brighter, more complex autumn flavor to this wonderful rustic dessert. I loved the interplay between the sweet-tangy, tender apples (I used Pink Lady ones) and the sticky, gooey sugary quince with its subtle acidic note. Yes, I loved the inside. But boy, let me tell you about the outside, too. Braker, who lives in Palo Alto and has been teaching baking for 35 years, sure knows how to put together a crust. If there ever was such a thing as a perfect crust, this could be it. It’s very buttery, so crisp it shatters when a fork cuts through it, and so multi-layered flaky that my husband thought it nearly bordered being puff pastry’s more svelte cousin. It’s the technique that creates such a masterpiece. Flour, a smidge of cornmeal, sugar and salt are stirred together, then tiny pieces of cold butter are cut into the mixture with a pastry blender. Tablespoon by tablespoon, ice water is sprinkled over the mixture, then gently tossed with a fork. When the mixture starts to stick together, you use your hands to shape the dough into a ball, which is flattened and chilled in the fridge for at least 2 hours. What you end up with are small thin sheets of butter dispersed throughout the dough. When the tart is baked, the butter melts, creating air pockets, and thus, the resulting crisp, layered pastry crust. Yeah, I was lured by what’s inside. Really, I was. But I admit, I sure fell for what’s on the outside, too. So will you. Because both inside and out, this looker’s a perfect 10. To make pastry: In a large bowl, stir together flour, cornmeal, sugar and salt. Scatter butter pieces over flour mixture. With a pastry blender, cut in the butter until the mixture has many pieces of butter ranging in size from cornmeal to rolled oats to small peas. Sprinkle the ice water, 1 tablespoon at a time, evenly over the flour mixture, using a fork to toss and distribute the moisture until the mixture is moist enough to stick together. Add additional cold water, 1 teaspoon at a time, if needed. With your hands, gather the moistened particles together, using the side of the bowl to shape them into a ball. Flatten the dough into a rough square shape, wrap in plastic wrap, and refrigerate for at least 2 hours or up to 1 day before rolling. Before baking: Center a rack in the oven and preheat oven to 400 degrees. Line a rimless baking sheet with parchment paper. To assemble: If the dough is cold and firm from the refrigerator, let it stand at room temperature just until it is malleable enough to roll yet still cool to the touch, 15 to 30 minutes. On a lightly floured work surface, roll out pastry into a 13-by-12-inch rectangle about 1/8-inch thick. Loosely roll up the pastry wound the rolling pin, and then unroll it, top side down, onto the prepared baking sheet. Pleat border evenly to form a kind of ruffle around the fruit filling, similar to a drawstring purse that is open in the center. Lightly brush the pleated border with water. Sprinkle the pastry border with 1 tablespoon sugar. 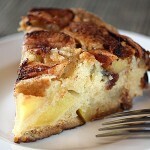 Bake galette until pastry is golden brown and crisp and the apples are tender yet still moist, 40 to 50 minutes. Transfer to a wire rack and let cool on the pan for 10 minutes. Slip a wide offet spatula, a giant dough scraper, or a small rimless baking sheet under the galette and transfer it (without the parchment paper) to the rack to continue to cool, 30 to 45 minutes. Cut quince paste into about twenty 1-by-1/2-by-3/8-inch slices. Skip them randomly under several of the apple slices so they peek out and highlight the dessert. 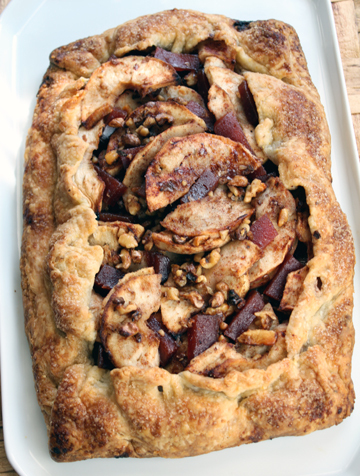 Transfer the galette to a serving plate or cutting board and serve warm or at room temperature. For the best taste and texture, serve the galette the same day it is baked. If the galette is made early in the day, do not add quince paste. Just before serving, reheat galette in a preheated 325-degree oven just until warm, 10 to 15 minutes. Then slip the qunice slices randomly under the apple slices and serve. nice post. Where did you get quince paste in the Bay Area? Cornmeal in the crust. Huh. That’s an interesting trick! 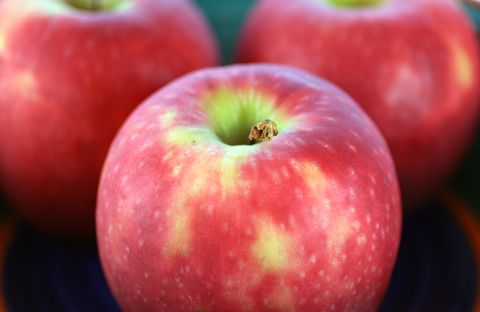 I so envy you in the Bay Area with access to some really great apple varieties right now! It looks fantastic and so tempting! I love that spicy filling! 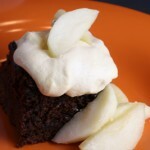 All the apple desserts I’m seeing lately look so good, and this one is a stunner. The crust looks amazing. So does the filling. I’m going to have to try this. What an amazing galette!! I so love that you added cornmeal to your crust,..that give a crunchy flavour!! MMMMMMM,..;apples & quice paste,..just lovely combined,…Yum Yum Yum!! Ann: You should be able to find quince paste quite easily in the cheese section of most any well-stocked supermarket. I got mine at Zanotto’s in San Jose. But Whole Foods also carries it. I’m guessing Cosentino’s in San Jose also should stock it, as well as Draeger’s on the Peninsula. Ohhhh yes – the outsides of desserts MUST be as good/tantalizing as the inside, if you ask me 😉 Love that galette! Lovely! This looks soooo delicious. I love the free form and ease of the galette! It sounds so yummy. Would the pastry be appropriate for a regular pie? Love the quince paste in this recipe. I’ll have to try it soon! Quince paste, that’s brilliant! This looks incredible. Do you recommend that book? I’ve been considering adding it to my collection. SkinnyGirl: Yes, I would think you could use the crust recipe for a regular pie. You may or may not have to double it if you’re doing a double-crust pie, though. Sorry that my hubby didn’t bring any of the galette into the office for you to try. I sheepishly admit that he and I ate it all ourselves. We simply couldn’t stop eating it. Hah. A galette…the lazy man’s pie! It is so our style. Food Gal, you’re just holding a master class on baking aren’t you!? This looks so beautiful and perfect for the season since I’m seeing lots of apples at the markets. And I’ve always thought quince is such an exotic ingredient, so what a great use for it! Goodness. 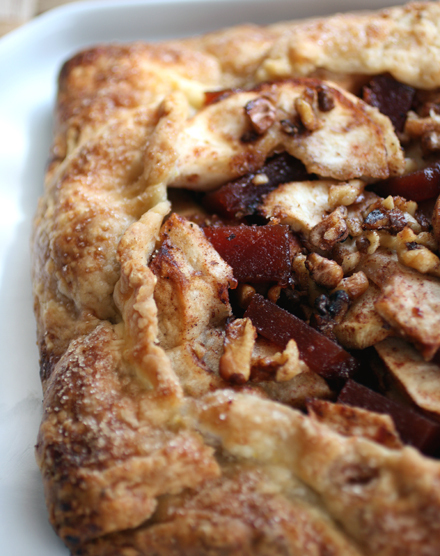 I love how rustic this pie is…yum! That crust is absolutely perfectly golden! [Sigh] This galette is a thing of beauty. Reading the instructions for the crust, I realized that although I do bake on occasion, I rarely use my hands! That is, my endeavors always involve a mixer – I even use a bread machine. I suppose that kind of direct contact intimidates me – I don’t have a machine to blame if it fails. But going over the recipe above, I could actually envision myself handling the dough . . .
Our apple tree produced a bounty of fruit this year (Haralson, my MIL believes) – I think they deserve something more than a plain apple crisp: an open-faced galette may be just the thing. Printing it out right now . 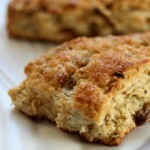 . .
Just made the Autumn Apple Treat (I used the brown sugar) and it was great! My family liked it very much. Thanks for the recipe. It is tasty and so easy and quick to prepare. Herbs Natura: So glad you liked the galette. I am definitely making this again, too. I absolutely loved the flavors and the crust texture, of course.